I’ve been making smallpipes for ten years now and I remember in January 2004 trying to make a self-imposed deadline for my first customer. Making pipes, bellows, and reeds at that time before so much instruction was on the internet was a hard thing to repeat, and trying and failing to make a deadline was stressful. Now ten years later, what’s different? I finished 5 sets this month (one of which is for me), having started them all back in July. I’m also a lot better at it than I was ten years ago. I’m faster and do things more elegantly. I have better tools. I have a helper to do some of the work with me. I went off to Houston for New Year’s and spent some time with friends before going to the Western Texas Hill Country for a music retreat with Clandestine where we were led through some new arrangements by Scottish songwriting legend Brian McNeil. If I had been home I would have been working steadily toward making the deadlines for my customers waiting at the Sheperdstown workshop the next week. Clandestine played a Friday show, sold out the Mucky Duck a couple of days later. The next day I set out to make the familiar 16 hour drive back to Asheville where I had six days to complete these five sets. Luckily they were all well underway and I had help this time from my partner in crime Rosalind Buda. I cancelled all other plans on the schedule and spent the week working on these sets every minute I wasn’t eating or sleeping. Six days working every minute. No practicing. No returning phone calls. I had hoped to make it up to Sheperdstown on Friday for the first jam of the weekend but at 2 pm I was still nailing bellows together. At 10:30pm, after six days holed up in the house working a quickly, smartly, and very efficiently, I finally put the last instrument in its box. The pipes were done and all I had to do was shower, pack up, and drive 7.5 hours to my first class at 10 AM the next day. I stepped out of the house at 12:30 in the middle of the night and into an inch of new snow, with a white frozen road in front of my driveway. Now I’ve got about 9.5 hours to make an 7.5 hour drive. In the snow. With 80 miles of frozen mountain highway in front of me. I ended up going 20mph behind a big truck in the driving snow on a completely frozen unsalted interstate for an hour, tires sliding trying to get up an overpass. I pulled into Sheperdstown the next day right at 10:00am having slept a few minutes pulled over on the road. I asked myself when could I get a little sleep with classes, a concert, a jam session that night? Never, and stop asking was the reply I felt come from inside. Ten years experience I have now trying to balance pipemaking and performing. I’m a lot better at it now than I have ever been. I quit taking deposits some time ago to try and alleviate the stress of deposit-driven deadlines. There are still deadlines though and customers attending workshops need instruments by a certain date. Now that I’m looking back on a decade of instrument making I realize how much this job, and the job of touring musician have taken away from the other job of actually creating music and building a repertoire that pushes forward. 2013 was a year full of great concerts and adventures. I’ll revisit some of the highlights in the coming weeks now that I have time to go through pictures and write about it. I wish I had had time to do this months ago but the year was just so full and there was no time. I’m on a bit of gig-hiatus now that 2013 is over, the new shop space is put together, and the last of the smallpipe deadlines are delivered on. 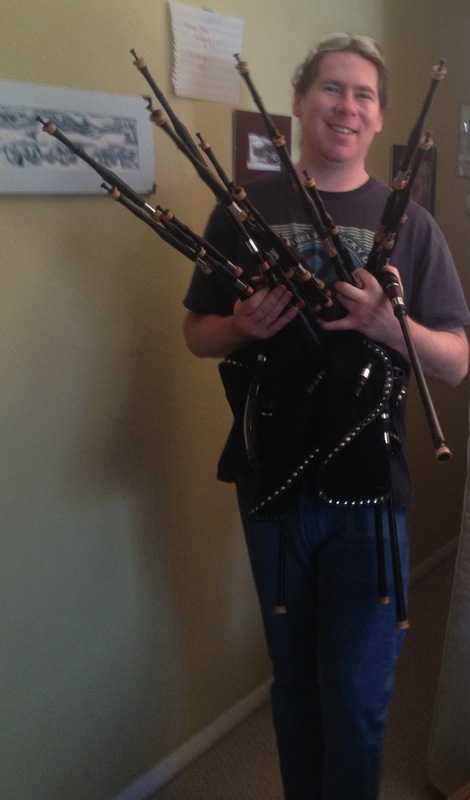 I’ve been in a years-long cycle of not practicing while trying to get instruments made, then going out of town for a tour and not being able to practice while on the road, then getting back home to weeks of smallpipe deadlines, then going out of town again for more gigs, then coming back as fast as possible to get pipes done…. It’s time to interrupt that cycle of not making time to practice. I’ve got some great things planned for this year and it’s time to train for what’s to come.